Hello Summer! Memorial Day weekend has now passed our calendar year, which means that summer is in full swing. For many people summer means traveling and being outdoors. This past weekend, the D.C. area saw a lot of people getting their fill of out door activities, so I of course wanted to join the fun. My best friend, Yana, was visiting from New York, so my friend Megan (who also lives in D.C.) and I had an idea to show her one of our typical weekend activities. 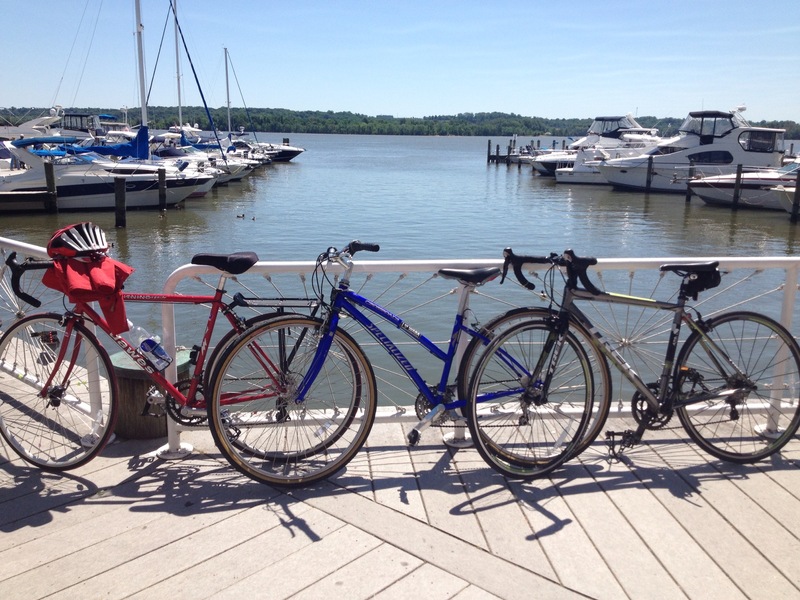 Biking around D.C. has become one of my favorite weekend activities. It’s also the best mode of transportation on the weekends. The Mt. Vernon Trail is one of my favorite routes outside the city. It runs from Arlington, VA through Alexandria to Mt. Vernon. My favorite part of the trail runs from just over the Potomac River from the National Mall to Alexandria, VA. Riding along the Mt. Vernon trail from this entrance across the Jefferson Memorial, you pass the 14th Street bridge and make a right onto the trial. If you are taking a leisurely ride, stop at the large field outside Reagan National Airport and wait for a plane to land or takeoff. It’s a spectacular sight. You’ll also get a sense of being so close to the aircraft, as if you could touch it. Continue past the airport, follow signs towards Alexandria. You’ll pass wooden bridges along the gorgeous waterfront and enter into the beautiful historic town. The ride from Capitol Hill in Washington, D.C. to Alexandria is about 10 miles. We managed the ride back and forth in under two hours, with some stops for photo ops, and to add some air into our tires. Next stop, continue onto Mt. Vernon, past Alexandria.